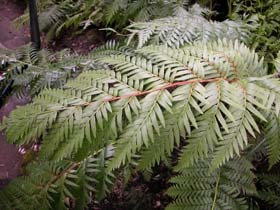 Todea barbara (king fern) is the only member of this genus and family in Tasmania. 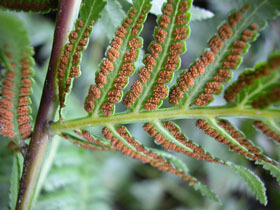 It is a large and common native fern. One of the most distinctive features of this fern is that large individuals produce massive fibrous trunks that may be as much as a metre or more high - these trunks are irregular in shape, unlike the cylindrical trunks of the true tree ferns (Cyathea and Dicksonia). 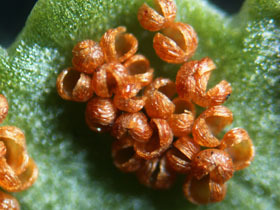 The leaves are pale green and bipinnate (at least at the frond base), and, when fertile, the undersides of the pinnules are covered in a diffuse mass of sporangia.